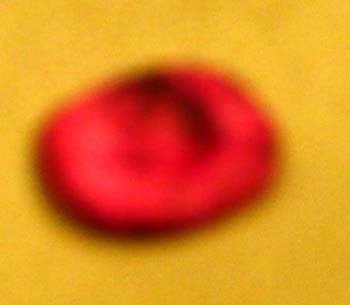 Little red thingy. Cick on the image for a big version. More pictures from ArmadilloCon 2008 are available in my photo gallery. Nobody really knew what this thing was in reality. Even my camera didn't want to focus on it, despite me trying different settings. Maybe this thing really... wanted... to... evade... detection? :-) Lou Antonelli suggested this may be the eraser of a #2 pencil after a guy messed up and crashed the pencil. But it lent itself much better to science-fictional uses. Rhonda Eudaly. It's your entire supply of nutrients ready to eat. S. Andrew Swann. It's a spaceship that has crash-landed. Lou Antonelli: this is a hat that goes on the head of a little guy that will make the planet complete and it will enter the age of Aquarius. Lou Antonelli. An alien probe? It would be really cool if an alien race would sense the pen's vibrations and realize what it was used to write. S. Andrew Swann. It can be used as a pen, but the electronics gets smaller, so this could be a camera, a cell phone, and an iPod. This could quite possibly double as an input device. Look at those dots on the side. Maybe you change its function by realigning the dots. Lou Antonelli. What if the only way to undo a spell is use the same pen and write it backwards?... BIC on it means "basic information compiled". It contains all the world encyclopedia. Rhonda Eudaly. It's a key and a map. When you point it to a star, it projects out a map of that star system. And then it becomes a key that opens a stargate. A woman from the audience. It's an intergalactic GPS. Rhonda Eudaly finds science-fictional uses for a glass nail file. Cick on the image for a big version. More pictures from ArmadilloCon 2008 are available in my photo gallery. Rhonda Eudaly. It's a religious talisman, kind of like Easter Island statues. You put it in the ground and it stands there. And when the sun glints at those pretty things, it projects a calendar, which tells you when you have to plant the crops, etc. Or it's an interspecies pregnancy test. Or possibly it's a weird key at a molecular level. So it doesn't need any funky hashes or anything. And those red things are indicator lights that light up when there's something wrong with the mechanism. Or something like that. I want to get as far away from [what Rhonda said earlier]. Lou Antonelli also concurs it could be used as an Atlantean pregnancy test. Rhonda says to the woman who supplied this nail file: I dare you to use it again! S. Andrew Swann. If it is a high-tech pregnancy test, maybe the red things lighting up mean something like, it's a boy, it's going to be blond, 6'3", and probably gay. 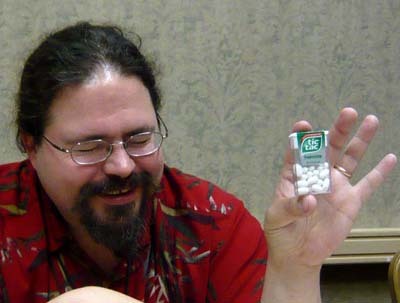 S. Andrew Swann imagines science-fictional uses for tic-tacs. Cick on the image for a big version. More pictures from ArmadilloCon 2008 are available in my photo gallery. Lou Antonelli. As a dragon is about to roast you... it could be a good commercial. A dragon breathes fire on you, a guy throws a handful of Tictacs into his mouth, the dragon munches of them and say: "minty fresh"! And the tagline of the commercial could be, so fresh it could stop dragon breath. Rhonda Eudaly. I was going to say, alien baby eggs. But that's like alien seeds.... Memory crystals! You could store all your information. Little bitty flash drives. Data storage. They're great for espionage, because they look like breath mints.